Record-high numbers of homelessness in the nation’s largest city have concerned advocates brainstorming ways to aid the problem. One unlikely crusader, a design agency, is approaching the issue with a rather futuristic idea: 3D printing. FramLab, a New York City and Oslo, Noway-based creative agency is among the frontline of companies taking advantage of 3D printing’s benefits to serve the greater good. The company’s founder, Andreas Tjeldflaat, is heading up the ‘Homed’ project — a way for homeless citizens to shelter with dignity. Tjeldflaat is in the third year of planning for his project. He says 3D printers are capable of producing strong and durable structures at a fraction of the price and time that it would take using traditional construction. 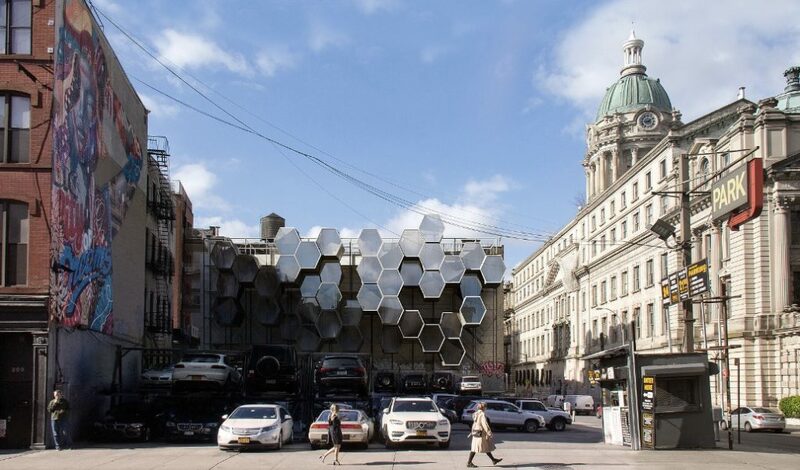 His single-occupant, 3D printed housing pods are designed to create a honeycomb-like cluster that could be attached to the outside of any vacant wall of a multi-story building. They would be accessible to occupants via scaffolding. The units are designed to be easily portable and durable for year-round weather conditions. Tjeldflaat says FramLab’s next step is creating a full-scale mock-up of one of the pods. He estimates it will take under $5,000 per unit to make, which is significantly lower than traditional construction. The Texas-based construction company ICON has also experimented with creating homes using 3D printers. They have begun a 3D printing project for small, 600 to 800 square-foot homes that cost only $4,000 and less than 24 hours to create. ICON officials saw the potential to use their massive-scale printers to help those in desperate need of shelter. Partnering with the San Francisco-based housing non-profit organization New Story, they plan to provide hundreds of single-family homes to impoverished areas of El Salvador. “We’re in the middle of a global housing crisis and making old approaches a little better is not solving the problem. Our belief is that the homebuilding industry needs a complete paradigm shift,” said ICON CEO Jason Ballard. Coalition for the Homeless, or CFTH, is an advocacy group responsible for regulating shelter conditions in the city. They agree that the crisis needs to be addressed, but think the solution lies with a different approach. “As enticing as it would be to say, ‘oh we have a new model for temporary shelter,’ which is an important component of the social safety net, what we really need right now is a focus on permanent affordable housing,” said CFTH Policy Analyst Jacquelyn Simone. According to the Department of Homeless Service’s Report for August of 2018, there were a total of 62,166 homeless citizens registered in shelters at one time. This is a number Simone says is “outrageous” as over 22,000 of them are children. This number does not include the unknown groups of homeless who sleep on the street. Tjeldflaat is aware that the shelter system is a massive help for many. He also knows there are issues within the current system. Simone said that is why CFTH is pushing for the ‘House our Future NY’ campaign; a plan that would need the mayor’s partnership. Since Mayor Bill de Blasio took office in 2014, he has made an effort to chip away at the growing number of homeless by financing an affordable housing plan. “Homelessness didn’t occur overnight and it won’t be solved overnight, but our city’s comprehensive strategies are taking hold, with the shelter census remaining flat for the first time in over a decade,” said Department of Homeless Services Director of Communications Isaac McGinn. Simone said stabilizing that number was a good start, but as long as the gap between income ever-rising rent in the city continues to grow, the problem is not going anywhere. “The problem right now is that we’ve stabilized it at record [high] levels. What we really need is for [the Mayor] to not just rest on his laurels. We really need him to take the next step to dedicating more affordable housing resources to tackle this problem so we can see that census going down,” she said. The Mayor’s plan currently sets aside 5% of the nearly $1 billion budget dedicated to affordable housing to homeless New Yorkers specifically. Simone says with the ‘House our Future NY’ plan, that number would be increased to 10%, and significant strides could be made in creating about 24,000 new subsidized homes, and, ultimately, be less expensive. “The cost for one [average] family to be in shelter for a year is more than $62,000. It’s actually cheaper to subsidize someone’s rent,” Simone said. Tjeldflaat agrees that in order to solve such a complex issue, it would take more than just the homes he, or any other agency could provide. It requires work “on a broad regulatory and policy-making level.” His hope is that the design community can remain in the conversation, and offer aid when and where they can.